For the next several weeks we’ll be rolling out our list of the best The Moment’s of 2013. The list is the product of winnowing down 173 moments from April to October into the best twenty. They vary in their importance but all captivated us in an important way. A few are silly, a few are excellent plays, and a few will travel down in Tigers lore. I hope you enjoy it. This one doesn’t really need much description. The game turned out to be a 4-2 victory in extras, but this moment was a Moment for the sheer entertainment value. In fact, I’m not sure the two players involved could have matched the occasion any better. The smile on Pena's face as he tagged Swisher was priceless. Like there was a practical joke that Swisher wasn't in on. Over the last couple of weeks, we’ve been taking a look back at the 2013 Tigers and looking forward to the 2014 version of the team. We’ve taken a look at the rotation, bullpen, infield, and outfield – and somehow Avila and Holaday ended up not finding a home within any of those posts (Happy Birthday, Alex!). Let’s now take a look at the team as the sum of its parts. Five critical pieces of last year’s team are gone and Smyly is in an entirely different role. Peralta, Infante, Fielder, Fister, and Benoit will all wear different uniforms in 2014, which means a number of key positions will feature new players. New doesn’t necessarily mean better or worse, but it does mean that the style of play is going to change a good deal. And that’s before you consider that the manager and a good portion of the coaching staff is different, as well. You can never predict baseball, but it’s safe to say that an infield consisting of Castellanos, Iglesias, Kinsler, and Cabrera will be better than one that included Cabrera, Peralta, Infante, and Fielder. How much better is up for debate but earlier this offseason, I estimated the difference being somewhere between one and six wins. That seems like a big range, but the lower bound is an improvement, so it’s going to be a feature of the team. You don’t have Fielder and Cabrera playing at spots at which they were among the very worst in the league. You’ve gone from a pretty good shortstop to a great one, and you’ve made a lateral move at second. Rajai Davis alone is going to double the team’s SB totals, but Kinsler runs the bases a little bit, and basic addition by subtraction will help by getting Fielder off the basepaths. Guys like Jackson, Dirks, and Iglesias might also be turned loose on the bases by the new coaching staff, but that remains to be seen. The Tigers traded offense for speed and defense this offseason, there’s no question. Fielder to Castellanos is a step down. Peratla to Iglesias is a step down. The differences aren’t huge, but if you had to bet, you’d bet on the 2014 Tigers being worse at the plate than the 2013 Tigers. We’re talking about a win or two worse due to Fielder’s down season, but that might end up being an important win. This one is cheating because it was pretty much impossible for it to get better. The 2013 Tigers were one of the best couple of rotations in baseball history, so even if they kept the band together, it wasn’t going to measure up. That said, trading down from Fister to Smyly, in addition to the natural regression, leaves the Tigers at least two wins worse in 2014, but probably something closer to four or five wins worse. That’s still amazing, but it’s worse. The words “Joe Nathan” inspire confidence, but Benoit was a very good reliever last season. You lose Smyly for Krol, which is a downgrade. You gamble on Joba, who has stuff but hasn’t been effective in a very long time, and then you go to battle with Rondon, Al-Al, Coke, and Putkonen – all of whom you had last year. Coke should be better and Rondon could make a leap, but even if you squint, this is the same quality bullpen at a higher price. The opening sections make this sound like a doom and gloom post, but it isn’t. The Tigers were a great team in 2013. They won 93 games, but that includes completely phoning it in during the last five days of the season, having a completely injured Cabrera for the last six or so weeks, and some general underperformance of their peripherals due to some extremely weird management decisions that would be hard to repeat (Read: Valverde). The Tigers were a true talent 96-97 win team last year that won 93. This year, they’re probably a 90-91 true talent team that could win anywhere from 86 to 96 games. There are always elements of luck and fortune, but the Tigers are the best team in their division pretty comfortably. The Royals are better this year, the Indians are probably worse, and those other two teams don’t even register. The Tigers stumbled through this offseason after the Fielder deal, but they were working from such a position of strength that it’s probably not going to matter as far as the regular season goes. There’s plenty left to happen before Spring Training and real baseball, but as the offseason winds down, the Tigers are a weaker version of a really strong team. That’s not satisfying relative to what they could have been, but it’s still not something over which to lose your head. They’re going to be good, but we’re past the point of good being a novelty. This is going to be a transition year for the Tigers, but that doesn’t mean it’s going to be a bad one. So it’s come to this; everyone’s favorite part of any baseball team. The bullpen. The ‘pen. Those guys at whom you scream constantly. We’ve gone through the rotation, infield, and outfield, and we’re left with relievers. Technically, we haven’t covered catching, but let’s leave that alone for now. Name G IP K/9 BB/9 HR/9 ERA FIP xFIP fWAR Status? The Tigers clearly didn’t see a future for Downs, but I actually think he’s got what it takes to be a very strong middle reliever. Aside from that, the loss of Benoit hurts and losing Smyly to the rotation will no doubt cost them. They added some pieces to compensate, which we’ll tackle in a moment, but there is a lot of value to make up just by considering who isn’t coming back. Let’s also throw out some names who don’t figure to play a major role at the start of the year, but who did participate in the 2013 run. Reed, Alvarez, and Ortega didn’t have a lot of time to do much of anything in 2013, and they’ll be lurking at the first sign of trouble. We should also have an eye on guys like Casey Crosby, Luis Marte, and Corey Knebel as potential arms coming north during the season. That said, predicting bullpen call-ups is a crapshoot. Look for the guys throwing well when the big club needs an arm. Could be the six guys listed, could be anyone. Let’s focus now on who we expect to be on the roster for Opening Day. Signing Joe Nathan was extremely predictable. The Tigers have wanted a closer forever, and they finally got their chance to buy one on the open market. It was a strange strategy, given they had just previously traded the cheaper Doug Fister to Washington, but in a vacuum, Nathan is a quality reliever on a reasonably fair deal. If you take away the time he missed in 2010-11 due to injury, he’s been one of the best and most consistent relievers in baseball for a decade. He’s a step up from Benoit, although not a huge one, but the Tigers are paying for that luxury to the tune of an extra $2.5 million a season. Nathan should be very solid and reliable at the end of games for the Tigers in 2014. Krol is only about 30 innings into his big league career, so it’s too soon to look at his numbers and get much of a sense about who he’s going to be. He’s got a solid fastball and a nice hook. He’s got a chance to be a #1 lefty or maybe a quality setup man. He should be a nice piece for the team, but he’s also stepping into Smyly’s old spot – and there’s a very limited chance that he could perform the way Smyly did in 2013 because that was top of the line stuff. Spending $2.5 million on a one-year deal is almost never a terrible move. As long as you’re willing to bail if the experiment fails, there’s no harm in it. Even a player like Delmon Young or Yuni Betancourt isn’t a disaster at $2.5 million. So signing Joba wasn’t a bad move, but it doesn’t inspire a lot of excitement. It’s been several years since Chamberlain was a valuable player and while scouts still like his stuff, he’s had serious command and homer problems. Joba might be a useful reliever, and getting him together with Jeff Jones could do wonders, but don’t expect the name-value of his 2007-2008 performance fool you into thinking this is a lights out reliever. Al-Al is a fun one, because his strikeout and walk numbers are both crazy high. Actually getting a hit is pretty rare. He gave up homeruns for, literally, the first time in his career in 2013, but remains deadly when healthy. In over 100 career innings, his ERA and FIP are both below 3.00. He’s a lights-out type guy with the potential to blow up on occasion, but he’s also pretty fragile. You can’t count on him for back to back days and fully healthy seasons, but when he’s on, there are few better at getting out of a tight spot. Coke is one of the league leaders in antics, but as far as his pitching goes, he’s a mixed bag. Coke had a pretty solid track record coming into the 2013 season, but just had a rough go of things the entire way. He was slated to be the team’s closer entering the first week, but quickly lost that gig to a very quick hook from Jim Leyland. He struggles with righties, but should be able to bounce back a bit and share the left-handed duties with Ian Krol. Coke isn’t anyone’s idea of a relief ace, but he’s a nice piece to have in your middle innings. Also, sprinting out of the bullpen is encouraged. I think Putkonen gets overlooked because most of his work comes in mop-up time, but he’s actually a pretty nice arm out of the pen. He’s got some zip on his fastball and generates a good amount of ground balls to go along with a decent mix of strikeouts and walks. He’s not a relief ace, but he was pretty good in 2013. Having him working the middle innings should work just fine. It’s only 45 career innings, but he’s working with a 3.35 ERA and 3.66 FIP. The Tigers could do worse. Rondon is pretty much the key to this entire thing. He did pretty well in 28.2 innings in 2013 and has the kind of velocity that can bail you out of a lot of situations. His breaking ball is better than some acknowledge, but he has a control problem that might hold him back from top end status. That’s sort of the story of the entire bullpen. Other than Nathan, this is a mix of guys with stuff to burn that haven’t been able to command that stuff too often. Rondon has the ability to be a top flight arm this year, but he could also meltdown. I guess that’s always true of anyone not named Rivera, but it’s important to consider. Let’s frame the whole thing like this. The talent is in place for this to be a nice bullpen, but that’s been true of most of the recent versions. This is their strategy. They load up on stuff and velocity, and then hope those guys keep it together. They’re running a high variance con, either they make out like bandits or they’re in jail by the end of act one. On the whole, swapping out Benoit and Smyly for Krol and Nathan is something of a wash, so comparing them to last year comes down to how much you buy a Joba resurgence, Al-Al’s health, and Rondon’s ability to harness his potential. From my perspective, they were a middle of the road bullpen and will be a middle of the road bullpen again in 2014. Continuing our series looking back and forward at various aspects of the Tigers roster, we’ll pick up today with the new Tigers infield. Earlier this month we covered the starting rotation and outfield. Since the infield is pretty much different at every spot, this one will take some time, which means the minor contributors like Santiago, Worth, Perez, Kelly, and Tuiasosopo are going to get a passing mention right here and then we’re going to forget that they exist. Same goes for Lombardozzi, but man is that a fun name to say out loud. Cabrera had a pretty impressive 2013 season, all of which is chronicled in the five preceding links. The theme was pretty much “ridiculous hitter to the point where being hurt for two months and being a bad defender only limited him 7.6 WAR.” His 192 wRC+ led the league and he won his second straight MVP (even if he wasn’t exactly the best candidate). We don’t need to spend much time on Cabs. He’s an all-time great hitter and he’ll be sliding back to first base for 2014 which should take some of the pressure off and hide his less than stellar glove. The major projection systems are all in agreement on Cabrera as something between 5 and 7 wins for 2014, which would fit right in with expectations. He’ll be a great hitter with a slightly below average glove at first. He’s not likely to have another 7.5 WAR season, but that’s only because 2013 was his peak. One more great year should lock him in for the Hall of Fame, too, so we have that to look forward too. Oh, Jhonny. He turned in a fantastic 2013 (3.6 WAR in 107 games) season until he had to sit out 50 games for his 2012 connection to Biogenesis. His impressive offense from the shortstop position mixed nicely with his ability to handle the position better than many think and gave the Tigers a big boost during the middle part of the season. Unfortunately, players who are that talented start asking for lots of money and he’ll be spending the next four seasons in St. Louis. Infante was another one of the Tigers who turned a great season into a big deal, this one with the Royals. Infante’s 3.1 WAR in 118 games was a big boost for the team and a very nice resume builder that would have been even nicer if not for a very late slide in Toronto that kept him out of action for several weeks. The year and a half reunion was nice, but we’ll have to settle for seeing him 18 times a year rather than 162 going forward. What’s Behind His Somewhat Down Offensive Year? Fielder had a tough year on and off the field and it ended with him heading to Texas in a deal for soon to be analyzed Ian Kinsler. Fielder was a solid hitter, but he’s paid to be a great one which had people on his back especially during the postseason. He’s a prime candidate to bounce back offensively, but his serious lack of value on the bases and with the glove makes the cost of a down year pretty big. Iggy joined the Tigers at the trade deadline to fill in for Peralta and to take the reins once he left during the offseason, which he did. Iglesias is an elite defensive shortstop, which means to be a very good player he only needs to cross a minimum offensive threshold. He did that in 2013, so even with a slight regression in 2014 with the bat, he should be a very good player up the middle and should make the pitching staff swoon. All three projection systems have him for 1-2 WAR, but they are all very conservative with their defensive estimations. If they correctly assessed his offense and we project him to be a top of the line defender, he’s more like a 2-3 win player. Plus, stuff like this. Kinsler didn’t play for the Tigers in 2013, so who cares what his season was like, amirite? In all seriousness, Kinsler is a pretty good defender who runs the bases well and has a pretty good bat for second base. He’s getting older and some of those things are trending in the wrong direction, but he should be a nice contributor in 2014. All three projection systems tag him for about 3.5 wins for the Tigers, which would wipe away Infante’s departure without any problem. Nick is the big question mark for the Tigers infield going into the season. We’ve seen Cabrera for years and got to know Iglesias in 2013. Kinsler is a new Tiger, but his skill set is very well established. Castellanos is the unknown. A lot of people think his bat will be excellent at the big league level, but those things don’t always happen right away and his defense has never been a strength. The projection systems range from 0.5 to 2.0 WAR for Nick based on a wide variety of offensive estimates. Based on what I’ve seen and heard on him, I’d call for something like .270/.320/.425, which is a little better than league average all the way around. Throw in some below average, but not terrible defense and you’ve probably got an average-ish player for 2014. That said, I think the bat will develop nicely and he could be a fringe all-star before all is said and done. I wrote earlier this year that the newly minted infield should add about one to six wins on the defensive side of things over the 2013 version, but that will come at a cost on the offensive side of things. Cabrera should be a little worse, Kinsler should be a wash, Iglesias will be significantly worse than Peralta, and Castellanos should be worse than Fielder. The Cabrera regression was going to happen anyway, so that’s not really fair to consider, but all in all, I’d say the overall infield is a win or two worse in 2014 than they were in 2013. The Tigers still have a nice collection of players, but it isn’t quite what it was a year ago. Some of that is unavoidable, but some of it wasn’t. Hopefully, they’ll still be able to take the division without too much trouble. Dave Dombrowski doesn’t go to arbitration. He just doesn’t. On Friday the Tigers came to terms with five players ahead of the arbitration filing deadline, leaving only Alex Avila without a settlement. Scherzer, Porcello, Jackson, Dirks, and Alburquerque all inked deals to avoid going to an actual hearing. The Scherzer deal is the headline story, as the Tigers put a $15.5 million bow on his first six years of service. The Tigers will talk extension with Max, but if something doesn’t happen soon he’ll likely dip his toe in the free agent market and think about topping the Zack Greinke deal from a season ago. With Kershaw locked up for at least five years, Scherzer will be the best pitcher on next year’s market and that should make him an embarrassingly rich man. Earlier this offseason, I suggested the Tigers ride out his final year and let him walk. So far, that’s what’s happening. Porcello will make $8.5 million in 2014 in his third arbitration season, but he has one more coming thanks to his Super Two status. We’re big Porcello fans at New English D and have been banging the extension drum loudly for Porcello all season long. A five year, $60 million sounds reasonable, yet too good for Porcello to ignore, even if Jon Heyman is completely clueless about what good starting pitching costs these days. can see why #tigers shopped porcello now, with that $8.5M settlement. can also see why there were no takers. Jackson grabbed $6 million in his second arbitration season and is another guy who might be worth locking up long term, especially coming off a year that was a step back from 2012. Lock him in before he has another great year and you’ll be pleased that you did. Dirks ($1.625M) and Alburquerque ($837,500) were first timers and were paid as such. The interesting case is Avila for a couple of reasons. First, the Tigers haven’t been to an arbitration hearing during Dombrowski’s tenure and they are reasonably close to one with the Assistant GM’s son. That’s fun! But also, they are pretty far apart ($3.25M and $5.35M). If the Tigers actually take this to trial, they’ll probably win, but it should be worth it to them to add a little on to their offer and avoid the headache. Avila is a very solid defender with the ability to be great at the dish, but his early 2013 struggles will certainly depress the dollar amount for which he can ask. He hit well down the stretch and I like him to contribute in 2014, but combine his health issues with some inconsistency at the plate and $5.35 million just isn’t happening. Imagining Al Avila, sleeping on the couch after his wife kicks him out for trashing Alex at the arb hearing. I know a lot of mothers, and they would all be very unhappy if their husbands took their sons to arbitration. After these settlements, the Tigers are right around $140 million before getting to Avila and the league minimum players. Last year, they had a payroll of $148 million, so the 2014 version figures to be their highest payroll yet. Hey, at least there was sort of real baseball news today! Last week, we looked back at the Tigers rotation from 2013 and ahead to what they might become in 2014. Today, we’ll do the same thing with the Tigers’ outfield. Thankfully, there aren’t many moving parts so we don’t have to dig into all sorts of complicated permutations. The Tigers 2014 outfield is going to look a whole lot like the outfield from 2013. Should his second half slump worry us? On the whole, Jackson had a very nice 2013 season. He hit .272/.337/.417 in 614 PA which factors out to a 107 wRC+. He ran the bases well (5.7 BsR), and even though his defensive metrics were a touch below the average centerfielder, he put together 3.1 fWAR over the course of the season. His production was up and down, but on the whole, it was a very strong year. It wasn’t on par with his excellent 2012 season, but he’s still young and could easily settle in as one of the best handful of centerfielders in the game. The second link above takes you through some more detailed thoughts on 2014, but Steamer/Oliver/ZiPS all project him to be worth about three wins for the upcoming season. You have to prepare yourself for a two or three week DL stint due to a hamstring or oblique injury, but Jackson is a solid performer with a pretty nice ceiling. The big question entering Hunter’s first year with the Tigers was if he could sustain his new found opposite field, line drive, high BABIP approach. Turns out that he can and it’s allowed for an offensive reinvention for the aging corner outfield. He didn’t shine in right field for the Tigers, but he was replacing Brennan Boesch, so it still looked pretty good. He hit 117 wRC+ and ran the bases at a league average rate, so playing iffy defense in a corner still produced 2.5 fWAR. It’s probably safe to safe that his new approach is real and that we should expect a higher BABIP this year than his pre-2012 track record, but he’s also aging and has taken a turn defensively. Hunter probably isn’t going to get better in 2014, but he’s a solid player and figures to be right around league average in 2014. Steamer/Oliver/ZiPS have him at 1.9/1.3/1.3 for 2013, but I’m a touch more optimistic about his ability to sustain his above average bat than they are. Dirks took a step back offensively in 2013, but he made up for it with some really nice defense out in left field. He’s a great example of how value is value no matter where you find it. He’s never had a big platoon issue, but for some reason he keeps find himself in platoon arrangements. He had Matt Tuiasosopo in 2013 and will have Rajai Davis in 2014, but Dirks remains a guy who can hit right around league average with nice defense in a corner. Pretty much the definition of a player who is under-appreciated. Steamer/Oliver/ZiPS have him at 0.8/1.6/1.3 WAR for 2014, but they have very different PA assumptions 268/600/455. I’d bet more in the 1.5+ department if he stays healthy. Tuiasosopo got most of the at bats that didn’t go to Dirks and he raked for the first couple of months. Then life caught up with him and he reverted back to the player who couldn’t keep a big league roster stop for most of his career. The overall body of work was pretty solid for a bench player, but it was a tale of two halves – and the next act ends with him in the Diamondbacks organization. Kelly played the normal Kelly role, Castellanos only had a handful of trips to the plate, and Garcia was sent out of town for Iglesias. Kelly will continue to fill in for 2014 and Castellanos will primarily be at third, so we don’t really need to look forward with this group. Davis joined the Tigers this offseason on a 2 year, $10 million to share time with Dirks and will play primarily against left-handed pitching. He can hit a lefty (112 wRC+ career) and is one of the very best baserunners in the game (9.5 BsR/600 PA), so he’ll be a nice compliment to the Tigers outfield going forward. He can’t bring the same kind of thump as Tuiasosopo, but he should be able to match his overall production. There’s also a good sense that Davis is a well-known quantity. He’ll hit lefties well enough, he’ll run like crazy, and he’ll be okay defensively in left. You don’t have to worry about a huge variance in his performance, which is nice for a Tigers fan base that can often fret about performance fluctuations. Steamer/Oliver/ZiPS peg him for 0.3/1.6/0.3 WAR for 2014, but I think something right around 1.0 is a good bet, but it’s all going to depend on playing time for one of the newest Tigers. All told, the Tigers outfield should provide very similar value to the 2013 iteration. Maybe a little better, maybe a little worse, but don’t expect a whole lot of difference. So today I started a new gig at the SB Nation MLB news desk. It’s just another part-time writing job to add to my ever building portfolio of part time writing gigs, but as serendipity would have it, my second assignment was to write about Justin Verlander’s surgery. WAIT, WHAT?! Those are not words I knew could go together. Justin Verlander + Surgery? That doesn’t seem right, but here we are. It’s a core muscle tear, a lot like Cabrera’s and it requires about six weeks of rehab before being evaluated. Dombrowski expects Verlander to participate in Spring Training and they hope he’ll be ready to make his seventh Opening Day start. Verlander has been crazy durable – seven straight 200+ inning seasons – and has never even thought about going to on the DL. I’m not sure he would even know what to do. Is it an actual list that he has to sign? The tone from Verlander and the Tigers is positive, but anytime a player goes under the knife you worry and Verlander has 6 years and $160 million left on his contract, so it’s important that he comes back healthy. We’ll know more about how this will affect the team in a few weeks but the Tigers are now down to four healthy starters and Verlander. Six weeks ago they had six above average starters. Things change quickly. It’s always the opinion of New English D not to panic, but this is a panicky type announcement. Also, why did he wait until now to have the surgery. Don’t think about it too much or you’ll start to panic. I told you not to panic. But we also analyzed each of the starters quite heavily. Here’s a quick summarization of the coverage of each starter and then a preview of what we should expect in 2014. What’s Behind His 2013 Struggles? The story on Verlander was the tale of three seasons. He dominated in April for the first time in his career and looked poised for another Cy Young season but his April triumphs turned to struggles during the middle months as he fumbled with release point issues that affected his ability to utilize all of his pitches. But with the team coasting to a playoff berth, Verlander took his time to return to form and was absolutely lights out across his final 9 starts (including the postseason), leaving him with another 5 win season. Disappointing for Verlander? Sure. But not disappointing for almost anyone else. Going into 2014 it reasonable to expect another great season from Verlander. He’ll be 31 this year, which is the back end of a starter’s peak, but he’s coming down from a HOF type peak, so there’s plenty of room to have good seasons as he ages. Steamer has him down for 3.9 WAR, Oliver at 5.7 WAR, and ZiPS at 6.1 WAR for the 2014 season with the Steamer number coming in part from projecting only 192 innings. We’ve probably seen the end of Verlander as the consensus #1 starter in the league, but all signs point to another ace level season in 2014. Fister, the erstwhile Tiger, had two major storylines in 2013. First, he had another quietly fantastic season (4.6 WAR, 3.26 FIP, 54.3 GB%) that would have made him the ace on 22 of 30 MLB teams even though he was the fourth best arm in the stocked Tigers arsenal. His ability to limit walks and induce ground balls made him an under 90 mph force to be reckoned with in his second full season in Detroit. Unfortunately for us, it was his last as he was dealt to the Nationals in December. The other Fister storyline was his incredible HBP number, which ended up only being 16, but those 16 came quite early and for a while he was actually hitting more batters than he was walking. Needless to say, no one had ever done that. We’ll miss you, Doug! Porcello is really good. He’s a personal favorite of mine because his style of pitching (heavy grounders, low walk rate) is something I really enjoy but also because he’s an undervalued guy whom I’ve been trumpeting for a very long time. I encourage you to read the links above which chronicle a pitcher who added strikeouts, cut walks, and added ground balls over the last few seasons and turned himself into a really nice major league starter. He was easily the best #5 starter in the league and would have been a 2/3 on most clubs. And Porcello will only be 25 entering the 2014 season, which is still shy of the years in which a starter is usually at their best. I’m a huge Porcello believer, and with the addition of a curveball instead of a slider in 2013, he took another step forward. It also so happens that the middle link above was one of this site’s first big breakout articles, so there’s always going to be a connection between my success and his, which I think is pretty cool. Scherzer was all over the baseball world in 2013 as he had a breakout season and also lucked into a huge win total which caught the eye of less analytically minded. When push came to shove, I had him second on my Cy Young ballot (he won easily) to teammate Anibal Sanchez, but he was a very deserving candidate. Max added a curveball and continued his improved mechanics to the tune of more strikeouts, fewer walks, and fewer dingers. That’s a great formula for success as he posted career bests in ERA/FIP/xFIP and turned in 6.4 WAR. Max was great and it was great fun to watch him all season long. I adored the rotation in its entirety, but I had already developed my affection for Verlander, Porcello, Fister, and Scherzer, so it was Anibal Sanchez who really caught my eye during the 2013 campaign. He made excellent use of his changeup (as did all of the Tigers pitchers this year) and dramatically improved his strikeout and homerun numbers in 2013 while posting career bests in ERA/FIP/xFIP and a 6.2 WAR season. He also earned my Cy vote as the only knock on his campaign was that he missed three starts early in the year with an injury. When I vote on Cy, I pay more attention to rate stats than innings totals, which is why he got my vote over Max. All in all, it was an amazing season. *Oliver still has Smyly projected to relieve. All told, the rotation was amazing in 2013 and still looks to be very good in 2014. There was absolutely a case to be made that the Tigers should trade some pitching depth for offense or prospects this offseason, the only complaint is how they went about doing so. The rotation will be worse in 2014, but it’s coming down from a season in which they were 9.3 fWAR better than the second best rotation in the sport. They were an entire Sandy Koufax better than the second best rotation in the league, so even if things get worse, things will still be pretty great. This one is pretty easy to recap. The video does the talking. The Tigers welcomed the Braves to Comerica Park for their first interleague series of the year and destroyed them. On this Friday night, the offense shelled Paul Maholm and the Braves by putting up ten runs in the first four innings, half of which were driven in by Matt Tuiasosopo (I’m going to miss saying Tuiasosopo). Anibal Sanchez did the rest as he twirled 8 magnificent innings in which he allowed 5 hits and 1 walk across 29 batters. 17 of them, or a whopping 59% of them went down on strikes. 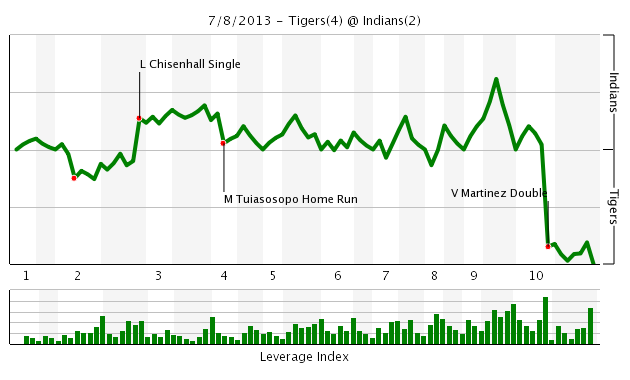 To give you some idea, Sanchez’s singled game FIP was -0.83. That’s a minus sign. You only get those when you’re really on. He threw 121 pitchers and batters swung and missed at 27. That’s a lot! 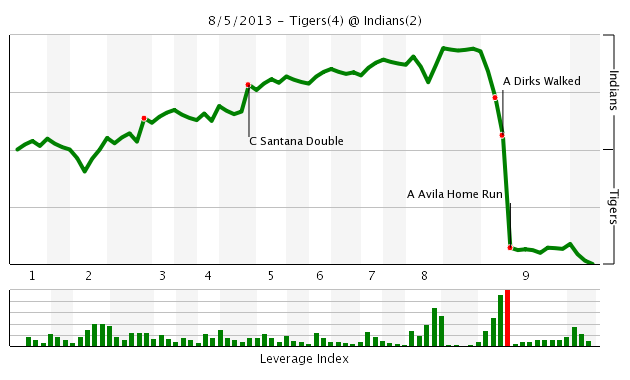 Alex Avila had a really rough first half of the 2013 season. He had a 60 wRC+ before the All-Star Break and dealt with a wrist injury in addition to innumerable foul balls. In the second half, he was much, much, much better, posting an impressive 140 wRC+ along with far better swings at the plate. This swing, chronicled as our 17th best moment of the 2013 season was one of the big turning points in his season, not just in result, but in approach. This was a classic Avila blast to left-center. The stage was set quite nicely for the 26 year old backstop as his battery mate, Anibal Sanchez had tossed 7.2 very strong innings in which he scattered just two runs. Which brings us to the top of the ninth inning in Cleveland. At this point, the Tigers were three games up on Cleveland entering a four game series at Progressive Field. They were in control, but a bad series would make it a horse race and a good series could be a dagger. Losing the first game wouldn’t have been devastating, but snagging it from the jaws of defeat was a two game swing in a matter of minutes. Fielder led off with a double to left. Martinez singled to left and scored Prince to make it a 2-1 game. Perez pinch ran and Dirks worked a walk. 2-1, no outs, top of the ninth. Alex Avila comes to the plate. The leverage index was over 5 meaning that it was a huge moment in the game (the average LI is 1) and Alex took the first pitch for a ball. 1-0 count, here’s the pitch from Perez. Avila crushed it to left. Tigers take a 4-2 lead. 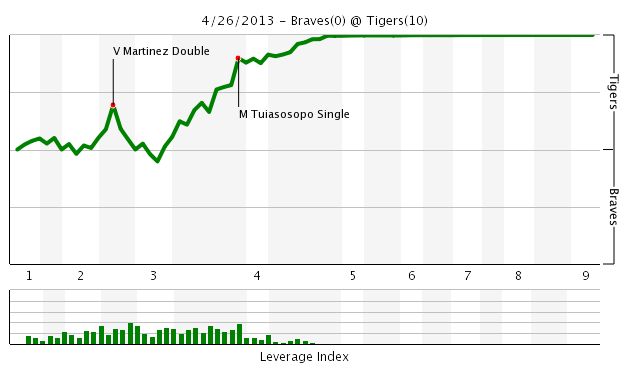 The Tigers had a 15.5% chance of winning the game when the inning started and were now all the way up above 93%. Avila’s blast capped an assaulting rally that helped the Tigers bury the Indians for good. Obviously both teams would have done differently things down the stretch had this game played out differently, but the Tigers won the division by a single game. And this was a pretty dramatic way to do it. 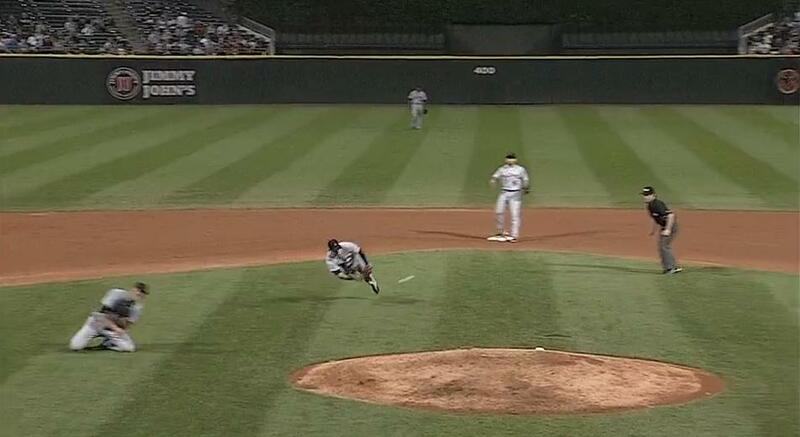 I think my downstairs neighbor is still recovering from how loudly I jumped up and down when Avila hit this one out.